Learning tricks and skills are one thing. Putting a piece together is quite another. Let me give you the secret: transitions. Your piece is likely going to include the skills that you have been working on for the past couple months. It’s the getting to and from and between that you will be working on as you put together your choreography. So, I’d thought I’d give you some tools to help along the way! 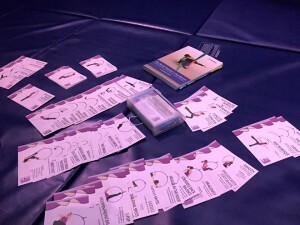 One big project that we have been working on here at AerialDancing.com is choreography cards. 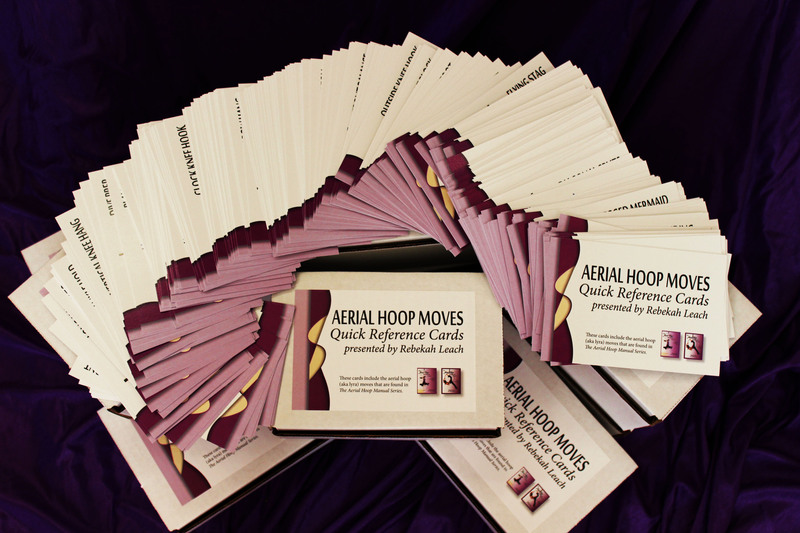 Our goals is to create cards for all the major aerial categories that we specialize in, (i.e. hoop/lyra, rope, silks, trapeze, aerial yoga, and sling). Pick a card. Don’t show anyone! Now act out on the ground how to get into the pose. When those watching you think they know the pose, they get up on the apparatus and mimic you. The first person to get the right pose is up next. Bonus: Let the ground charade inspire the ground choreography for your next piece! 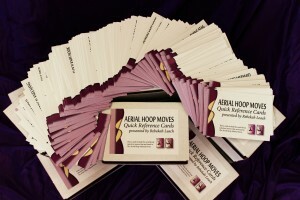 Pick two cards at random. Take turns coming up with a new route between the two poses. When a person can’t think of another transition, you’re done! Pick again. Pick 5 cards. Pick your favorite pose to be home base (or one that you want to practice a lot). Home base pose is your starting position. Move out of home base to the next pose and return to home base. Repeat for the rest of the cards. Did you find some new ways in & out of home base along the way? Pick two cards. Whatever your instinct tells you to do, go the other way. Follow that line of energy until you circle back to the move you’re trying to get to. Pick a card. Now turn it upside-down. Now try that pose. The challenge is making something that is possible! Keep in mind that it’s the body shape that you’re after. Bonus: If you are a pro at inverting skills, try turning the card 90 degrees next time. Pick three cards. Pick one to be your starting position. Move around the hoop so that it looks like you are setting up for the second pose but, at the last second, change course for the third pose that you picked. Pick three cards. Arrange them in one order, then another order, then another. There are six possible combinations. See if you can perform all six. Which do you like the best? If you have other games that you play or these inspire some, please share in the comments below! We’d love to hear about them. Creativity never ends ~ shared creativity doubles creativity.